When I was younger, for special occasions, my parents would always take me to this Italian ristorante in Plano called Compari’s. Aside from my love of coloring on their tables (Macaroni Grille style), my next love was their seafood cannelloni. I have yet to find a place that makes one just as consistently delicious. I decided to go all out one night and make some from scratch. 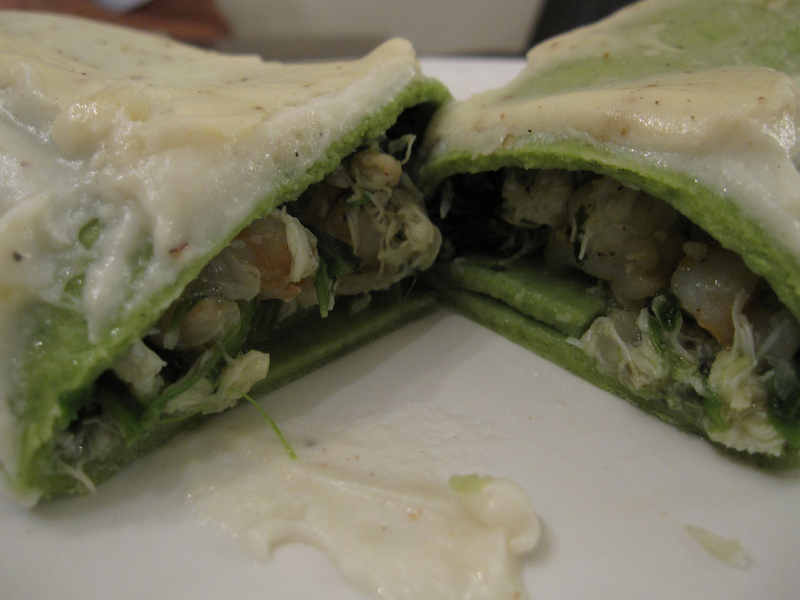 And to make things extra fancy, I added a little color and made spinach pasta dough. Verdict? Filling was superb, pasta could have been thinner, but overall a success. Good to eat shellfish while I still can. Blend the first five ingredients together. Pour into stand mixer bowl with flour. Mix ingredients on low until dough is formed. Add flour as necessary until dough no longer sticks to your hand. Take a handful of dough, form it into a small ball, and run through pasta machine. [I eventually thinned the pasta to the 4th setting, but next time I will try 5 or 6]. Cut pasta into 4-inch by 4-inch squares. Bring a pot of water to a boil and cook each sheet no longer than 25 seconds. Transfer cooked pasta into large bowl with ice water. Sautee onion in EVOO, add garlic, lobster, and shrimp meat until done. 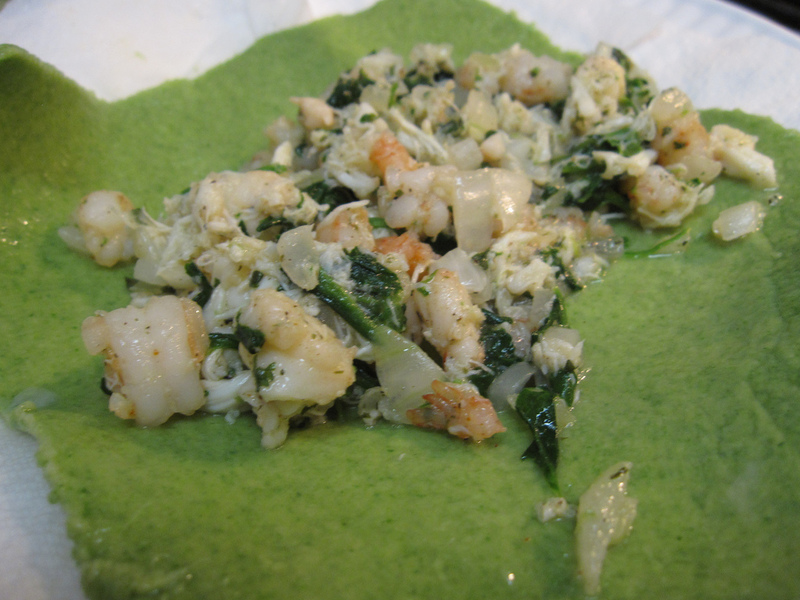 Add spinach, crabmeat, and herbs. Assemble the cannelloni by placing a small amount of filling in the center of each pasta square and roll up like a cigar. Repeat with the remaining pasta and filling. 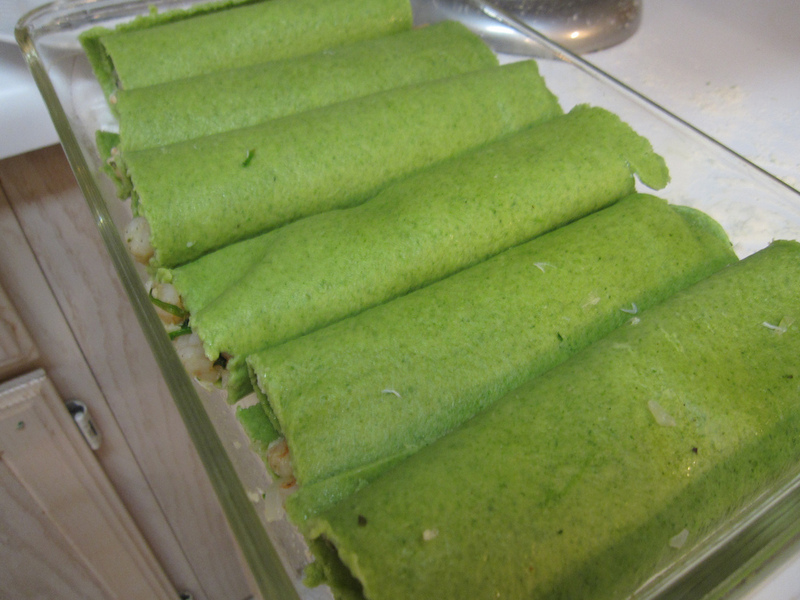 Lightly oil a large casserole dish and arrange filled cannelloni. In a small saucepan, melt 4 tablespoons of butter and whisk in flour. Cook for 2 minutes, stirring frequently. Add the milk and whisk to combine well. Bring to a boil, stirring frequently, and cook for 5 minutes, or until very thick. Season with S&P and truffle oil. 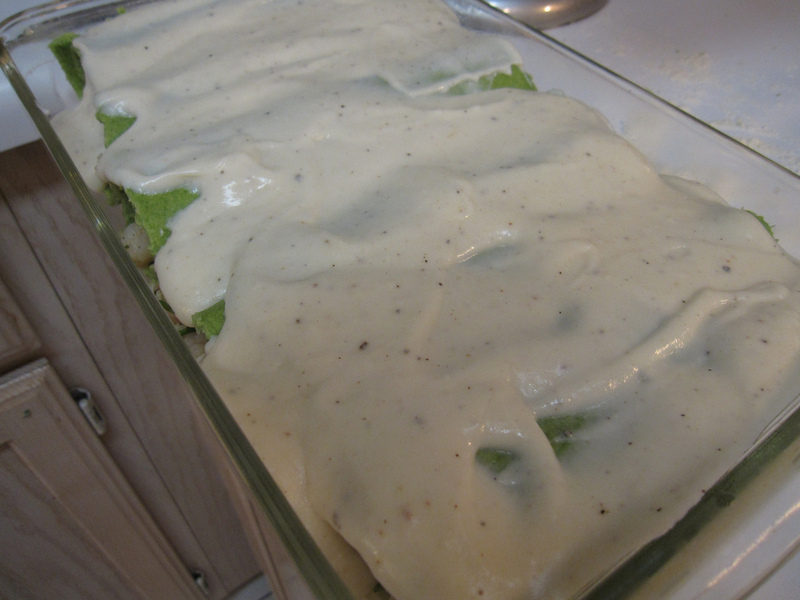 Pour sauce over top of cannelloni, sprinkle with grated parmesan, and bake for 20-25 minutes until heated through. [I covered mine with foil halfway through].